ST. PAUL, Minn. (AP) -Two nights after one of their worst first periods of the season, the Minnesota Wild responded with one of their best. The way the Wild's season has gone, that makes perfect sense. 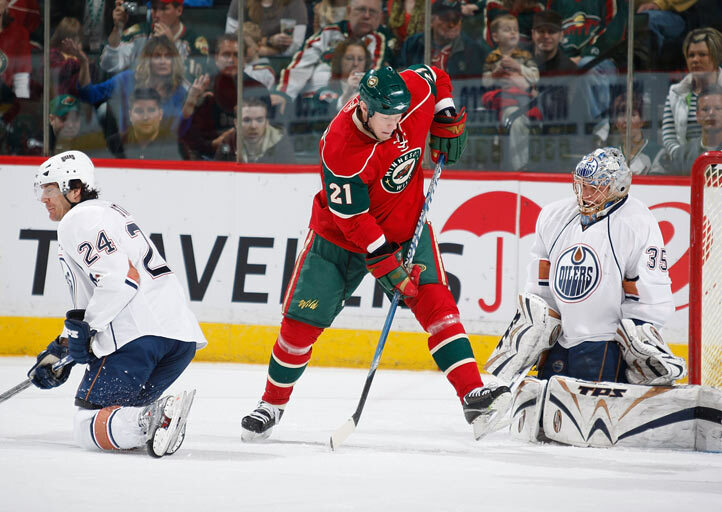 Minnesota scored two goals in the first seven minutes and Niklas Backstrom made 32 saves in a 3-1 victory over the Oilers on Wednesday night, bouncing back from a horrendous showing in Edmonton. "I know a lot was made of that game in Edmonton," Brian Rolston said. "We were on our heels. We didn't look good. We didn't have the energy. That was the bottom line. Those kind of games happen. It was good that we put that one behind us and came out with a big effort tonight." Sean Hill, Branko Radivojevic and Rolston scored and Mikko Koivu added three assists for the Wild, who started a four-game homestand with a victory to leap-frog Calgary into first place in the Northwest Division. The Wild have been jockeying with the Flames and Colorado atop the division all season long, and have home games against Vancouver, the Avs and the Flames before wrapping up the regular season in Denver. "It puts us back where we want to be," Rolston said. "And the next game gets bigger and the next game gets bigger and the next game gets bigger." Backstrom made several lunging saves to keep Edmonton off the board in the first two periods and got some help from a defense that left him exposed in a 5-3 loss to the Oilers on Monday night. The younger, faster Oilers ripped right through the Minnesota zone on Monday night, scoring three goals on their first four shots. "We wanted to bounce back here," Backstrom said. "We had a lousy game there and we can't afford to have anymore games like that." The Wild had the fast start in this one, scoring two goals on their first four shots to make things tougher on Edmonton, which had won 12 of its last 15 games to vault back into playoff contention. Fernando Pisani scored for the Oilers, who trail Vancouver by three points for the eighth and final playoff spot in the West. Getting in won't be easy. The Oilers started a three-game road trip and play four of their last five away from raucous Rexall Place, all of them against Northwest foes. "The teams are so close," Edmonton coach Craig MacTavish said. "Most of the teams are going to go right about .500 I would think. We can't, obviously. We need somebody else to go considerably less than that." Marian Gaborik and Radivojevic broke free on a two-on-one less than three minutes into the game, and everyone in the building expected Gaborik, the Wild's leading scorer, to take the shot. But he waited and waited, slipping a backhanded pass across the crease at the last possible second and Radivojevic finished it off. Just over four minutes later, Hill took a brilliant blind feed from Koivu on a power play and sneaked the puck past Dwayne Roloson on the short side for a 2-0 advantage. Roloson finished with 18 saves and his Oilers had plenty of chances, but just couldn't capitalize. They hit three posts in the second period and two more in the third. They also went 0-for-6 on the power play and gave up a short-handed goal to Rolston that made it 3-0 after two. "We hit a few posts, and if those go in it could've changed the outcome of the game," said Pisani, whose goal hit the post and went in for a rare fortunate bounce for Edmonton. "Obviously our power play wasn't clicking, but we had some good opportunities at the net, we just didn't capitalize." Notes: Veteran move: Early in the second period, Roloson wound up caught out of position as he lunged to make a save during a scrum in front of the net. He lay motionless on the ice to get a stoppage and received "medical attention" from the trainer, but managed to stay in the game. 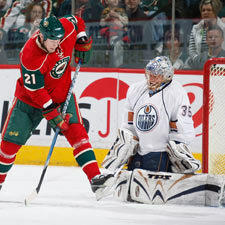 ... Rolston's short-handed goal was the first by the Wild since Gaborik got one on Jan. 3.